The San Jose Earthquakes announced that the inaugural match at Avaya Stadium is sold out to the general public. The inaugural match is scheduled for Sunday, March 22 against the Chicago Fire. Under 1000 tickets are still available for the match as part of season ticket packages. The news follows very promising corporate sales and shows ticket demand will see nearly all seats occupied in the upcoming MLS season. 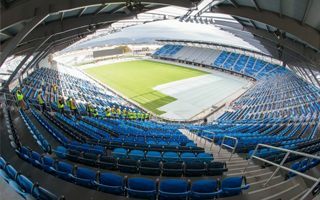 The 18,000-capacity Avaya Stadium, located near San Jose International Airport, will be the newest soccer stadium in MLS and is expected to be among the most technologically advanced in the world. The stadium features a canopy roof and the steepest-raked seating in Major League Soccer to provide the best possible fan experience. Additionally, the north end zone houses the largest outdoor bar in North America, a two-acre fan zone and a double-sided video scoreboard.